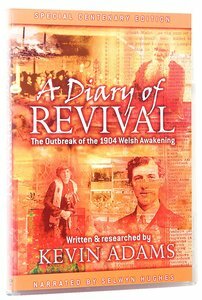 Through letters, interviews and photographs, the DIARY OF REVIVAL video and DVD examine the outbreak of the 1904 Revival through the eyes and thoughts of the great revivalist himself, the 26-year-old Evan Roberts. Beautifully produced, with narration by Selwyn Hughes. About "A Diary of Revival"
Selwyn Hughes died on 9 January 2006 ending a ministry that spanned more than four decades, in which he uniquely combined the roles of writer, pastor, counsellor and teacher. He also founded CWR (Crusade for World Revival), an international organisation that has spearheaded the training of Christian counsellors, leaders and workers and that continues to produce Christian resources, including the bestselling dated devotional Every Day with Jesus. Selwyn also authored dozens of other bestselling books, including Christ Empowered Living, The 7 Laws of Spiritual Success and his autobiography My Story. - Publisher.